Located on the Northern tip of Greenpoint, the Box House Hotel offers an authentic Brooklyn experience. This converted factory and its modern 4-story addition, combine to total 130 rooms. The converted factory features spacious loft suites with soaring ceilings, factory details, and kitchenettes. While the new addition sits on top of the factory and is comprised of modern standard rooms, many of which have terraces and views of the NYC skyline including the Empire State Building. All of the rooms are curated with original artwork and hints of nostalgia with thoughtful decoration and decor. Guests enjoy access to the hotel’s fitness center with sauna and steam showers as well as dining at the restaurant on premises. Franklin Guesthouse offers luxurious lofts and suites combining modern design with the comforts of home. Contemporary original artwork and antique relics add ambiance to the serene setting, while the on-premise restaurant and bar, business center, and gym with sauna and steam shower add convenience and luxury. 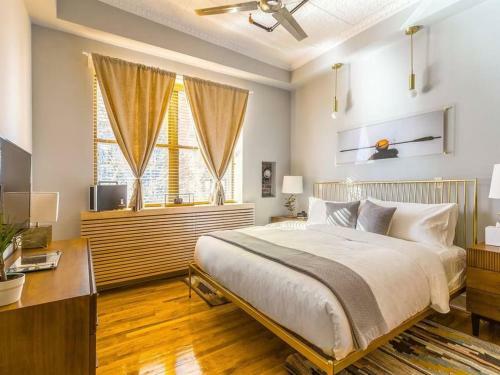 Conveniently located in the heart of Greenpoint, Brooklyn, Franklin Guesthouse is just steps away from many popular eateries and boutiques. 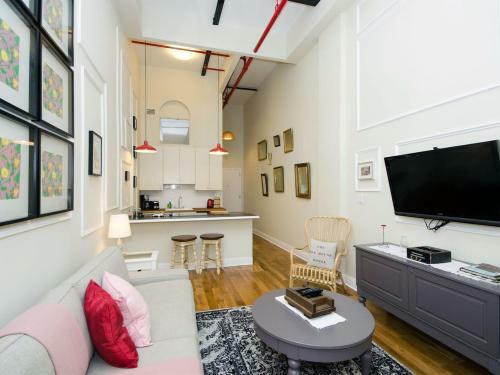 Within a two minute walk to the Greenpoint Avenue G Train station as well as the East River Ferry, guests benefit from easy access to the exciting bustle of Manhattan, while enjoying the relaxing lifestyle of one of Brooklyn’s most desirable neighborhoods. A newly renovated factory converted loft building in Greenpoint, Brooklyn. The building offers unique artisanal decorated and furnished lofts available for extended stay/short-term rentals from 30 days and beyond. Habitat offers a place for those visiting New York, those here for a temporary work project, or a home to bridge the gap in a period of relocation to or within our great city. The goal of Habitat is to capture the spirit of Brooklyn and embrace our guests and provide them shelter and stability in their time with us. 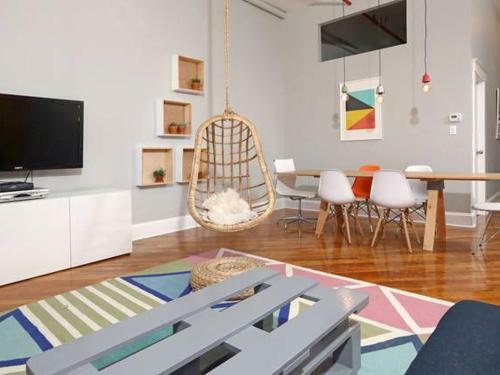 Work, live, and play, the Brooklyn way at Habitat 101.